Most of the improvements to a cyclist’s commute are achieved after hard work and years of campaigning. We don't get bike lanes, protected lanes, reduced speed limits or side guards on trucks unless we fight for them. So when the TTC unveiled self-serve bike repair stands at 10 subway stations across the city last month, it felt like a gift from an estranged uncle. The TTC is privy to the fact that many of their users commute via more than one method of transportation. By making the transition from bike to TTC a breeze, the TTC improves their service and can critically reduce stress on their crowded lines. The 10 inaugural repair stands are currently at Davisville, Bathurst, Spadina, Dupont, Pape, Keele, Finch, Kipling, Downsview and Kennedy stations. Strung onto steel cables come an allen keys, screwdrivers and wrenches, and there is a pump and wheel chock that can accommodate one bike at a time. 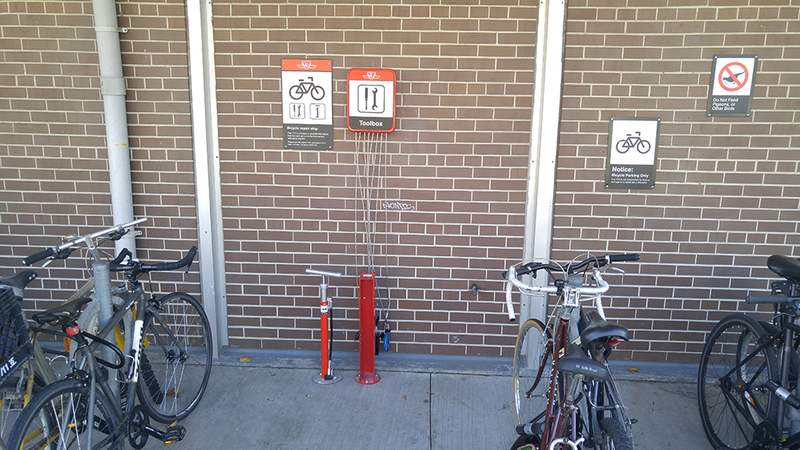 The bike repair stands are part of a larger path the TTC is on to better embrace cyclists. The new low-platform streetcars feature space on board dedicated to patrons with bicycles. 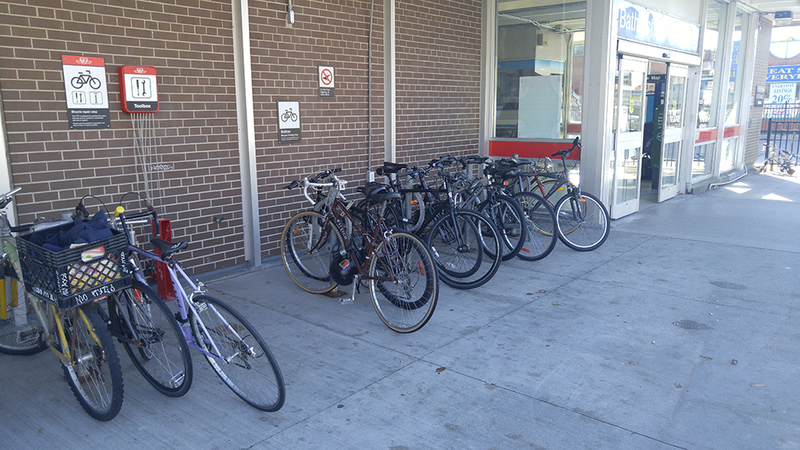 All buses (except Wheel Trans and community buses) are equipped with a bike rack to accommodate one or two bicycles. Subway stations are introducing easier access fare gates to ease the passage of cyclist-carrying commuters into and out of subway stations. There’s more bike parking around subway stations, and seven stations now feature bike lockers for commuters. Pape and Dufferin stations even have retrofitted staircases with bike channels. Although bicycles still are not allowed on TTC during rush hour (there are enough bodies crammed into those cars already), relieving some of the congestion by helping commuters combine bicycles and the TTC is a step in the right direction. And there may even be plans to go further. A recent Bike Share Toronto survey asked users whether they want to see payment for the service available through a Presto card, or bundled with TTC fare. Getting more people onto bicycles where they are available in the core (or eliminating the need to transport a personal bicycle on a crowded subway) is the next step. 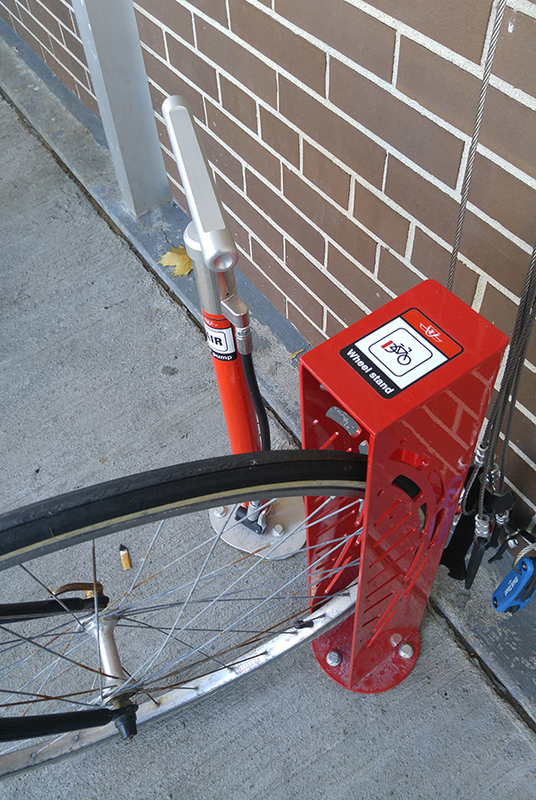 The current bike repair stands are part of a pilot project. After a year, the TTC will review them to determine whether to add more.